Our Great Great Great Grand Master, Chan Hai Yee, belonged to the Chan family of the Seng Dynasty in 960 AD. He worked in the Imperial Court as Feng Shui Master. Only male members of the society were allowed to inherit his knowledge of Feng Shui. Master Chan Hai Yee inherited this knowledge from the Chan family and the succession of this inheritance has continued to travel through many generations. The lineage was broken when our Great Grand Master Chue Yen, obtained his knowledge from a Taoist Master, Master Chue Sum of the Qing Dynasty 1616¬1911AD. This influence caused Master Chue Yen to convert to Taoism out of respect and thus the New Lineage of Chue Yen was established as Chue Style Feng Shui. Grand Master Chan Kun Wah was chosen by Great Grand Master Chue Yen to pass on the knowledge of Chue Style Feng Shui and to continue the Lineage after stringent training in many skills, including that of leadership. After 36 years of rigorous study, research and examinations Grand Master Chan was awarded the title of Master Chue Yan Kun Wah. Thus, Grand Master Chan embarked on his journey to continue the Lineage of Chue Style Feng Shui following the Rules, Constitution and Code of Ethics laid down by previous generations. It is now Grand Master Chan’s responsibility to choose a successor of quality and dignity. The successor must continue the Legacy of the Chue principles and take over his role when Grand Master Chan retires. Grand Master Chan’s successor will be named Master Chue Jan. The successful candidate’s role will be to listen to the Master and follow the Chan family knowledge. The names of the next twelve leaders who will continue our heritage, have been given to Grand Master Chan by Great Grand Master Chue Yen. 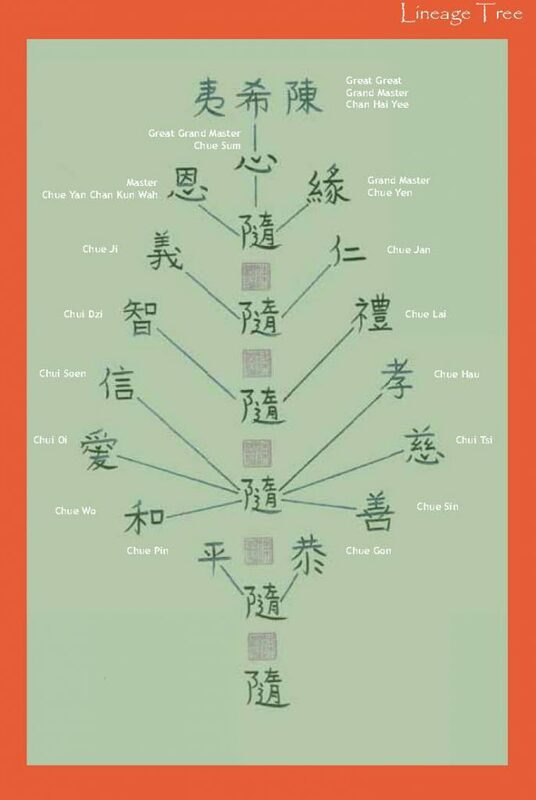 They have been written on the twelve branches of The Chue Foundation Tree (see illustration) When Master Chue Jan is ready to retire, he too will have the responsibility of choosing a successor in order to continue the Chue tradition and Lineage. This way the Chue Tree will continue its growth for many generations to come. As per the vision of Grand Master Chue Yan, Chan Kun Wah this Lineage will continue for hundreds of years to come and the name of Chue Style Feng Shui will be synonymous with the leading authority of the Feng Shui world. It was a historic moment when Grand Master Chan left Hong Kong, on the instruction of Great Grand Master Chue Yen to bring his sacred teachings to the West. His students feel very Blessed to have the opportunity to study with him and rightly so. Grand Master Chan lives by the Forth Road Bridge which links the North of Great Britain to the South. He himself is the Bridge between East and West. Thus, we have a fine example of one of Master Chue Yen’s most treasured secrets – Water Fire across the Heaven Pool. A Great Blessing indeed.